ALS (signed with initials). 1p. House of Commons. No date. To [William] Woodall. Together with a fine contemporary albumin portrait photograph. 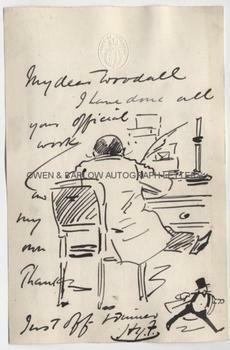 "I have done all your official work and my own. Thanks. Just off to dinner." 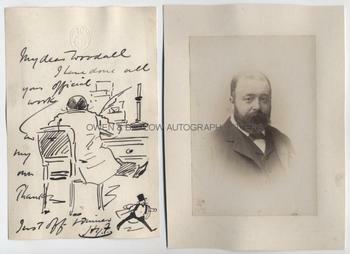 Incorporating a fine pen and ink drawing showing a back view of Harry Furniss, seated at a desk, quill pen in hand. With a further small drawing showing him in evening wear, struggling into a coat and hurrying away. 8vo. Approx 7 x 4.5 inches. 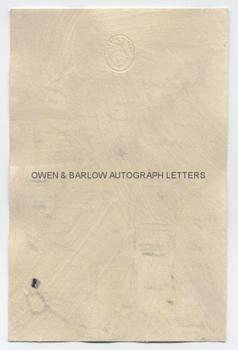 Mounting residue to blank verso, else fine. 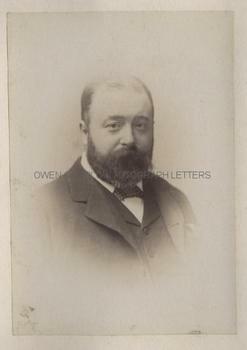 The portrait of Harry Furniss is a fine albumin silver print photograph measuring approx 5.75 x 4 inches (excluding mount). It shows a pensive looking Harry Furniss in vignette head and shoulders. The photograph is mounted on card from an album leaf. There is mounting damage to verso of card mount but the photograph is in fine condition. Harry Furniss was one of the best loved of Victorian illustrators. His drawings appeared in the Illustrated London News, the Graphic and Punch. He was also a noted book illustrator, including his work for Sylvie and Bruno by Lewis Carroll. His caricatures of politicians were one of his specialities and he was often to be found in the public gallery of the House of Commons, sketchbook in hand. He was a close friend of the radical Liberal M.P., William Woodall, and in the 1880s he had accompanied him on a tour of the Dolomites (see Furniss's autobiographical 'Harry Furniss at Home' 1904). It appears from this letter that, whilst at the House of Commons, Harry Furniss was also engaged in some private secretarial work for his friend.